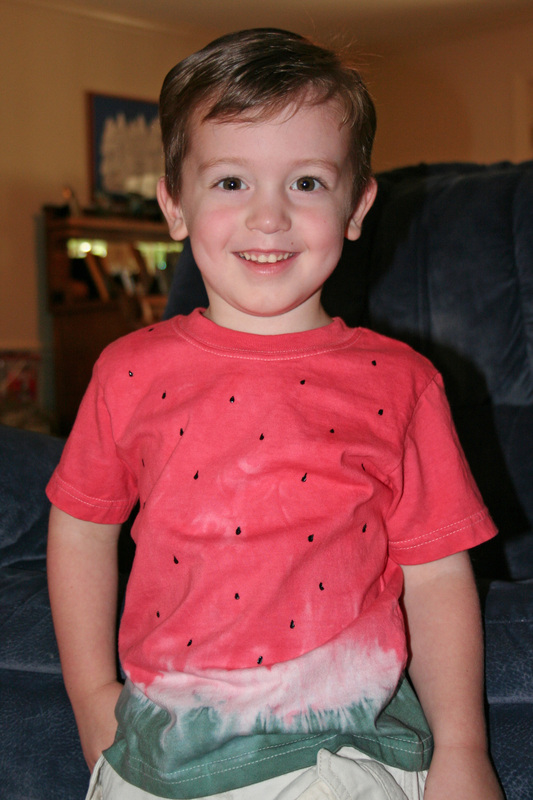 As if Emmie needed another stitch of clothing, I came up with this brilliant idea to make her a watermelon dress to match her watermelon-themed birthday party. Yeah, I’m an over-achiever. What’s it to ya? 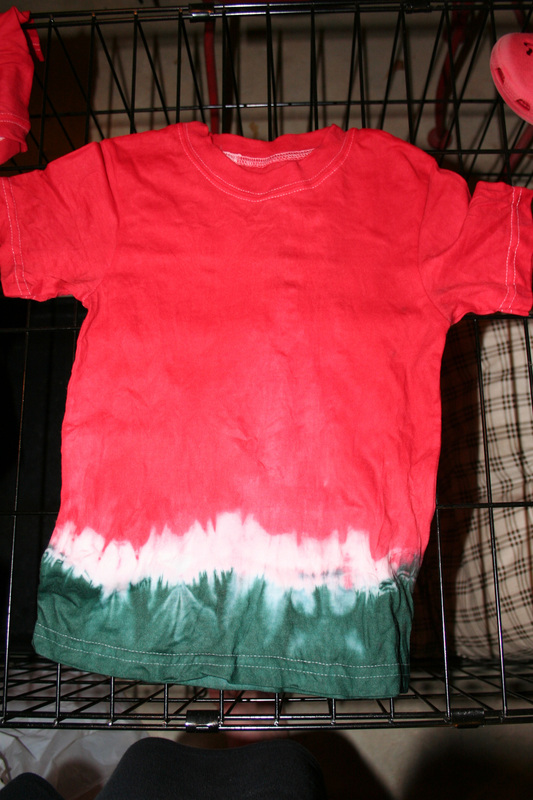 A long time ago I saw a picture online of a tie-dyed watermelon dress for little girls. It had directions, but when I tried to find it again last night, I couldn’t find it. I would otherwise give them credit for this cute idea! If you can find it, I’m sure their directions are much more thorough than mine. Anyway, I bought all the supplies yesterday without fulling realizing how long this whole process was going to take. I may be an over-achiever, but I’m also a procrastinator! Anyway…I bought all the stuff, and apparently you can only buy enough tie dye liquid to dye 50 billion pieces of clothing. So, I decided to not only make a dress for Emmie and a t-shirt for Tucker, but also dresses and shirts for our little birthday party guests. I didn’t want to waste the dye! So…it all turned out well, even if it did take me from 10pm to 2am the night before the party! 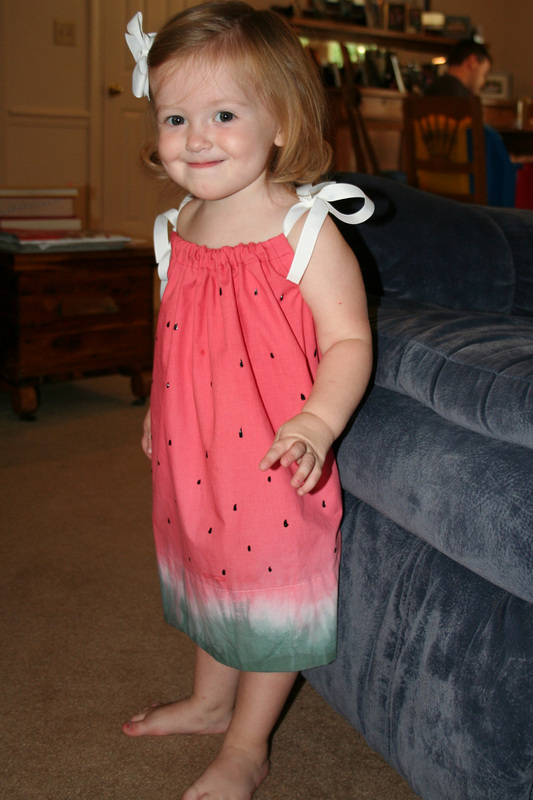 So…if you’re wanting to make one of these little dresses for your little watermelon, it’s really a lot easier if you plan ahead(unlike me). If you plan ahead you can let the suckers air-dry, which is where I went wrong. 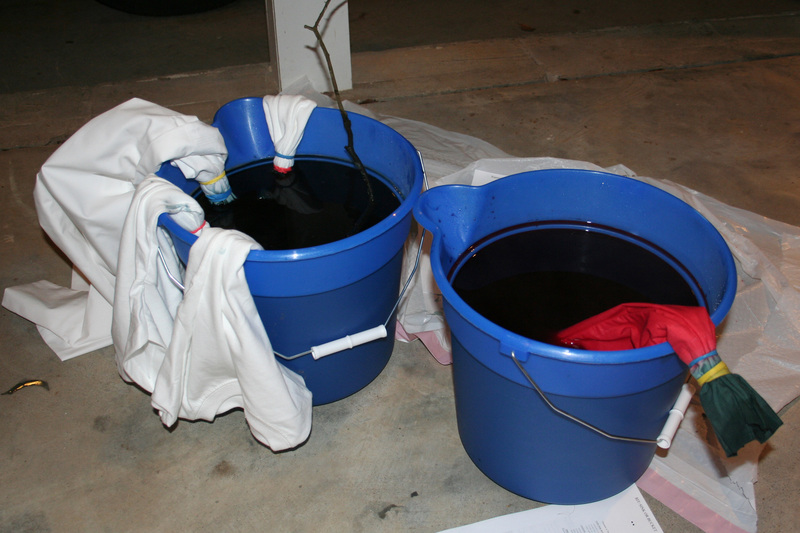 What you’ll need: red and green RIT dye, 2-3 buckets, rubber bands, clothing item, black fabric paint. Step one: Take 2 rubber bands and your clothing item. Put one rubber band a few inches above the hem, and the next rubberband a little bit above that. You’ll be dying the hem to rubber band part green, leaving the next little rubber-banded part white, and dying the top part red. Step four: This is where procrastination hurt me. If I’d had more time, I would have had the option to let the items air dry. As it was, I had to do the “quick-dry” method. This consists of rinsing the item in hot water, squeezing out excess dye. Then warmer water, squeezing out excess dye. Then slightly cooler water…and even cooler water…and then cold water, rinsing over and over again until it’s no longer “bleeding”. If you had to use the “quick-dry” method, you’ll now have to finish drying the fabric in the dryer. 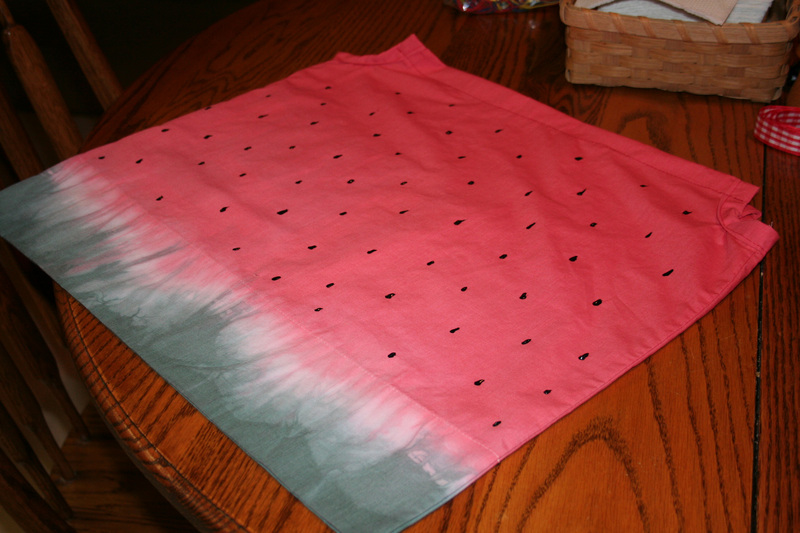 Step five: Use the black fabric paint to paint on all the litle watermelon seeds. Step six: If you are making a pillowcase dress, now is when you’ll want to sew it up according to the directions in an old post of mine about pillowcase dresses. If you’re just making the t-shirt, stop here! You’re done!